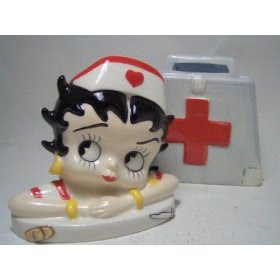 I didn’t know that Betty Boop was a nurse. She's been around a long time, but somehow I just can’t see an old school nurse running down the hallway in her high heel shoes. I MUST have this set of salt and peppershakers in my kitchen. I love kitschy stuff. 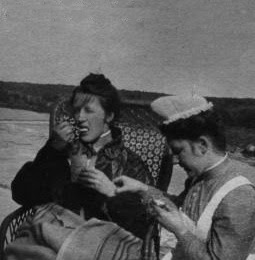 And speaking of salt and peppershakers, EDNuresesauras wrote a wonderful post about salt and pepper nurses. No, it doesn’t have to do with gray hair. Read her post, and bring your own Kleenex. Check this nurse out. I bet she gave good patient care. Old school nurses had time to focus on the basics. They fluffed pillows and got the wrinkles out of their patients’ sheets. ERnursey wrote a great post about maintaining standards of good patient care. There’s nothing like getting back to the basics. Old school nurses were really big on providing their patients with fresh air. This nurse is shown checking the vital signs of a patient taking in some fresh air. Too bad we all can’t take in some fresh air. Monkeygirl from Musings of a Highly Trained Monkey laments the lack of fresh air in the emergency room. It’s a great post! 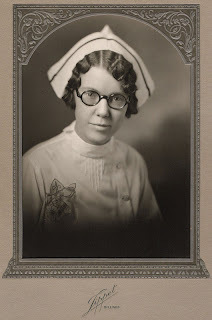 I’m glad I’m not the only Old School Nurse in the Blogosphere. I hope you enjoy these posts as much as I did. When patient care goes down and costs go up, you know that there are HMOs and insurance companies making a killing. Betty Boop? A SCHOOL nurse? I don't think so...the Cherry Ames in me would have to give up her cap!